Use quotes to search for an exact phrase. Use - before a word to exclude pages containing that word. StaffMap project databases hold all the information necessary for floors, desks and other assets, staff, reports, security groups, etc. that make up the project. Note - Only make changes to StaffMap project databases if you are familiar with working in web application databases already. Modifications to the database are not technically supported. StaffMap uses SQL Server Compact 4.0 databases. These file-based databases can be accessed by a number of different programs but we recommend using Microsoft Visual Studio. Microsoft Visual Studio Express 2012. (Microsoft Visual Studio 2013 does not include tools to open SQL Compact Edition databases). You can also use CompactView (requires a .NET framework version 4.0 or higher). Open the project's file directory to find the project database (project.sdf). Make a copy of the project file. This is now a back up in case changes need to be reverted. Open Microsoft Visual Studio Express 2012. In the top toolbar, select View > Database Explorer. In the Database Explorer, click on the 'Connect to Database' button (plug icon). 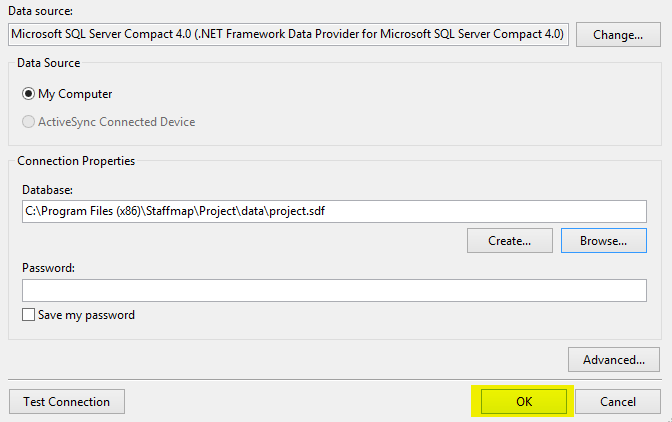 In the 'Add Connection' window, set 'Data Source' to Microsoft SQL Server Compact 4.0 (.NET framework). In the 'Add Connection' window, set the 'Connection Properties' Database' field to the project.sdf file by selecting 'Browse' and selecting the file in the File Explorer. The project.sdf file should now be in the Database Explorer. 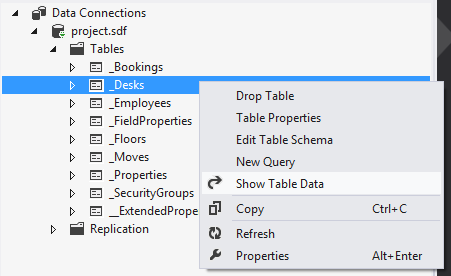 In the Database Explorer window, expand project.sdf. Right-click on any table and select Show Table Data. View the data or click on any table cell to edit it. Save the project database in Microsoft Visual Studio Express 2012 when you are finished editing.